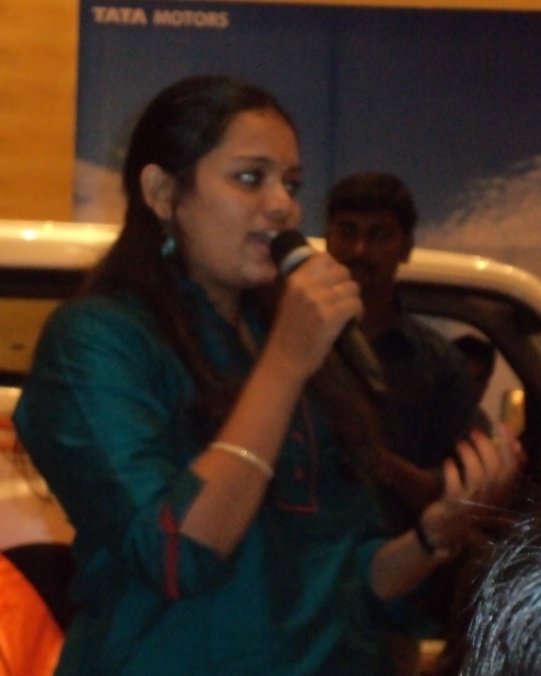 IndiBlogger Meet at ‘Namma Chennai” And I was going to miss it? Not at all! I was super excited when I received a mail from Indiblogger, about the Chennai Meet which they’d planned, since this was going to be the first time I would be participating and I made sure I’d made arrangements to see to it that I do not have any prior engagements on the same day. Though I did not know many bloggers from Chennai( Yes, that was before the Meet, Now I know a lot of them from Chennai), I was looking forward to see those whom I’d established contact with and of course, to meet new bloggers and make new friends as well. I reached there before the event was set to begin and I was surprised to see that people were actually busy with their mobiles than socializing with the fellow bloggers. It was then that I was informed we could use the Wi-Fi and tweet about the meet which was happening then. (We were actually trending on twitter that day. How cool!) And after a few good introductions among ourselves,( with the eminent food bloggers) the much awaited event, began. The first thing which they mentioned was, Never before had an Indiblogger meet started on time and in fact, It was the first time that people were all on time for the meet. Of course, when one is in Chennai, what less can they expect? After initial rounds of applause and freebies (I got a laptop skin 🙂 we moved on to the ’49 seconds of fame’, where Bloggers were chosen at random and asked to speak for 49 seconds. It was nice to know the face behind each blog, listen to their interests and what they had to say about their blogs. I made a quick list of what I would speak, if my name were to appear on the screen, I thought of a few points and when I held the mike, I completely forgot about them and managed to do a neat job, sans any stammering. Talking about this screen, when people registered on entering the hall, our names were displayed on the screen, saying “Ashwini walked in 2 minutes ago”. It made me feel like a celebrity. (Seriously, yes!). Then the Marketing manager and a few others from Tata Motors, took us through the Tata Grande Dicor, about its features and design. In fact, he did mention that they were surprised by the turnout, since they never imagined that bloggers from Chennai would participate with so much of enthusiasm. Later, when it was time for High Tea(great spread, Coffee was A1), I met Vipul Grover, Anand Arun, Sulaiman Sait, Kaushik and Vishnu. It was such a pleasure talking to them. We were discussing about bloggers from other states and that is when we were talking about Sujatha, Sahana, Saru, Subhrasis, Anne John, and a few others, whose names we did not know, but we were able to remember their blog names. Funny, how in the blogosphere, you aren’t able to place a person by their name, but by their Blog name and URL. I then met Shashi, I was in touch with him earlier, after he had mailed me about my Open Page Article. Just when I was done talking with him, there was this Marketing Manager, who was standing next to be, waiting for his coffee. I introduced myself and said that I would be starting work with TCS from the next month. I could sense a change in his facial expression, and he proudly said “ Welcome to the Tata Family, Ashwini. It is a Big family indeed.” I was feeling great and said I was looking forward to be an integral part of it. He then asked me about what I write in my blogs, and having listened to the conversation I had with Shashi, he asked me what I’d written for the Open Page. I told him all about my blogs and what I write about and that article in particular.Felt nice when someone enquired about my blog with so much of interest. We were back to the hall, now with a sheet and a sketch to share our blog links with others. It was at this time, when I was roaming about meeting many people and asking for their blog links, that I realized, I had either read most of the blogs before, or I was familiar with the names and the blog names, to a considerable extent.I made so many new friends then. It felt good when people were able to recognize my name and blog and even took time to appreciate me for it. We were then asked to choose one among the discussion forums. Majority of us opted for the No-Agenda group, which was the most happening group there. We showed our Chennai Spirit, we had fun, laughing and playing truth or dare. Everyone took it in the right spirit and carried out the dare given to them. At one point, almost everyone from the other groups where looking at us, wondering what on earth we could be doing, considering the amount of noise we made and the fun we had. It was memorable. We then proceeded to take a group snap,collected our T Shirts, and we also had a small photo session by ourselves( thanks to Kalyan and to all those who clicked pictures that day and were kind enough to share it with the others later.) and we left Hyatt after what was one the best evening ever, in the lives of the Chennai Bloggers. Looking forward to the next meet at Chennai. Man, that sounds like so much fun!! u remembered me there?! i am blushing – seriously. It was fun. And you could have come to Chennai. Thank you. Glad to have met up with you too. wish i would be able to attend similar meet one day….hopefully…!! Thanq for the group..I dint have the group photo..Nd yeah meeting ya was fun and the full meet itself was a hell lotta fun..Was my first and I too was thinking of skipping it and thank god I dint!! try checking out my blog and commenting..
thats kinda cool….sigh, i wonder if they will ever have one in london.. Yes we did. Hoping to see you at another Blogger meet. It was as good as how it sounds! You can get more photos from Kalyan and Shashi's blog as well. I've never been to an indiblogger meet. I also welcome you to the TATA family..to be more specific TCS family…. I'm so jealous of you and Anand. Anand has posted his picture on FB. Even, I want a T-shirt…Anyways, I'm so happy after reading your post…Thanks for sharing…You made us a part of it!!! WOW!! What a sum-up! Wonderful write-up and pics. How unknown people connect themselves through indiblogger is a beautiful thing! LOVED IT! 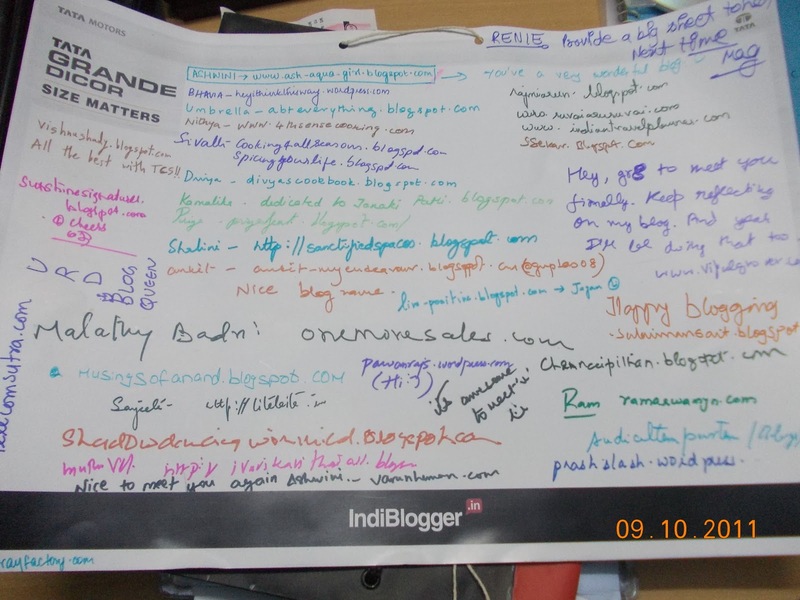 How I wish there could be ONE indiblogger meet where EVERYONE can meet. Sigh. I know I am asking something extremely difficult. Jealous of Anand? Check my Dp in facebook as well :D.
Thank you. I'm Honoured. Glad to know that you found my write up “Engaging and well written”. You just made my day. 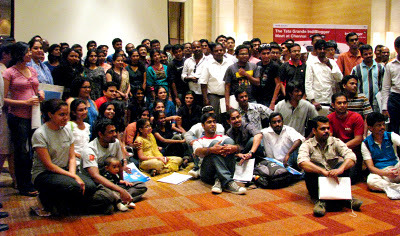 And next time there is a Blogger meet, try as much possible to participate. A different experience indeed! Somebody spoke abt me?!? Really?! God promise?! Wow! now I feel like a celebrity! lol! Sooo happy for you! Generally speaking I am not sure if I would attend such blogger meets because the whole idea of meeting strangers fills me with dread!! I am tooo nervous and shy and scared and paranoid abt making new friends! But I am glad you had a great time! Glad to read this one. I was there as well. I don't know whether you would remember me. Hope to catch more of your posts. @ashwini:- so kind of you for mentioning my name… Indeed it was a pleasure meeting you there.. also It was really awesome meeting Mr. Vipul Grover there….! Thank you Doctor ;). Yea had a nice time talking with you people. Wow! You really had fun. I'm also an indiblogger but am not from chennai. Btw My first giveaway at my blog. That was a great sum up!!!! Nice to meet you Ashwini!! I was even more glad when u came to me and said, I do follow your blogs!!! Aah…I was in the cloud Nine!! //Welcome to the Tata Family, Ashwini. It is a Big family indeed. Wooww!! that wud hv been an awesome moment for you hearing those words from him!! Hoping to meet you in yet another meet!! I wish i could ever get a chance to attend it. But your post was enough to picturise the real scenario over there..
You helped us preserve memories of that wonderful meet with your photos. Thanks a lot. And yea, it was nice to be addressed that way. Hoping to see you and the rest in another Meet as well. Extremely well written. I have been a part of the indiblogger community for a very short while now, but I have already started making friends, sharing information, getting feedback, and constructive criticism. I hope we will be lucky enough to experience something like this in Hyderabad soon too. Thank you. Hope there is a meet at Hyderabad soon. It sure looked like a lot of fun. Yes, wish I was there (smile). Thanks for sharing. Superb post Ashwini….Everyday should be a lot of fun. Revisiting this post after two years is magic, Ashwini. This showed up in the Link Widget and I couldn't resist reading again. Nostalgia.